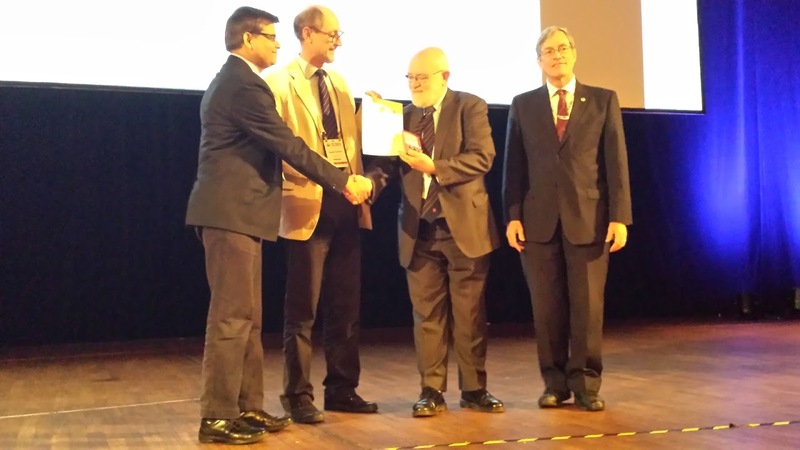 Left to Right: Anil Mishra (UNESCO), Hubert Savenije (President, IAHS), Pierre Hubert (Volker Medal Recipient), Paul Pilon (WMO). I thank the nominator Dr. Eric Servat for drafting the nomination. During his entire career, Dr. Pierre Hubert has been a very active defender and promoter of hydrological research. His research activity can be divided into three main parts. 1. As a young researcher he was first involved in the use of isotopes in hydrology and hydrogeology. He took part in the very first isotopic hydrograph separation that was published as soon as 1970. He played a key role in the paper by Mariotti et al. on "Experimental determination of nitrogen kinetic isotope fractionation" in 1981, which has been cited around 800 times and still at a level of 63 citations per year. 2. ln a second part of his scientific career -- and this is revealing of its incredible intellectual curiosity and open mind -- he was involved in studies on the economics of water and water management, developing approaches in mathematical modelling for simulation and optimization purposes. It is in this field of research that in 1986 he successfully defended his "Thèse d'état" on concepts and tools for Water Management, so fitting to the Volker medal. 3. Since 1984 he worked on the identification and modelling of time series and rainfall fields at a wide range of temporal and spatial scales, mostly related with developing regions of the world. He went to work in western Africa and in South America and took the opportunity to work with many local and regional scientists to whom he taught many of what was and still is a modern hydrology. He developed various statistical, geo-statistical, fractal and multi-fractal methods for rainfall fields and time series analysis. One of them, the "Segmentation procedure", is a very famous one that has been widely used by many hydrologists and other scientists. 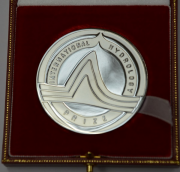 In addition, and completely in line with the scope of the Volker medal, he took an extraordinary part in serving the international hydrological community. He served as President of the French IAHS section from 1990 to 1998 and as President of the French IUGG section from 1998 to 2000. He was the Secretary General of IAHS from 2000 until 2011. Re-elected twice, he was a particularly involved and efficient General Secretary, committed to facilitating the access to IAHS for developing countries, stimulating collaboration and partnership with UN water organisations (in particular UNESCO and WMO) and promoting the worldwide visibility of IAHS and his activities. As a member of the IUGG Bureau, until this day, Pierre Hubert remains a defender and promoter of the water sciences both for the scientific aspects and for the direct and unique link of hydrology with civil society. For all these reasons, it is an honour to award the Volker medal to Dr. Pierre Hubert for his outstanding contributions and leadership in the promotion and application of hydrological sciences. Let me first thank the Jury for choosing me for the Volker Medal Award. This medal is especially precious for me as I always cherished and appreciated my association with IAHS, WMO and UNESCO. IAHS first probably, which elected me in 1987 as a Vice-President of the Commission on Water Resources Systems under the Chairmanship of Uri Shamir. Later, in the year 2000, I have been appointed as IAHS Secretary General by John Rodda and I had the pleasure and privilege to serve IAHS under four Presidents, the first of whom, John Rodda, has been my mentor and guided me wisely in the complex IUGG system. Later, I enjoyed pleasant and productive association with Kuni Takeuchi, Arthur Askew and Gordon Young. The cooperation of all IAHS Officers and Commissions, of many individual scientists from all over the world and the unstinted support from IAHS Press people in Wallingford, had facilitated to take IAHS forward. I profusely thank all of them for their unprecedented support and cooperation. WMO has been a very important organization for me because I have been for a long time the representative of France on the Commission of Hydrology and even, incidentally, that of Romania, during a surrealistic meeting of the Commission held in Nigeria. I hope that Arthur Askew will bring out someday his memoirs to highlight this meeting! I have been involved into many activities of WMO as a representative of IAHS and I even applied to become a member of its staff. Unfortunately, at least for me, the then omnipotent WMO Secretary General has chosen someone else for the position I targeted. UNESCO has also been an important organization for me, since I have participated, a long time ago, to my first International Hydrological Programme Council as the second (or third) Assistant to Marcel Roche, who was the head of the French Delegation. At that time I had the opportunity to meet Adriaan Volker who was then one of the most prominent leaders of the UNESCO International Hydrological Programme. I am also very happy to mention that apart from other productive activities in WMO and UNESCO I have contributed, with many others, to the International Glossary of Hydrology, and that I designed an electronic version of it, first prepared in four languages, which evolved after some years, and with the contributions from IHP, WMO and IAHS communities to a 15 languages version still hosted on the web. I even received last year a Tadjik version of the Glossary, that I unfortunately cannot include as the proper softwares were no more available! Hubert Savenije has quoted some of my works which are rather diversified, reflecting the need I always felt to integrate different “facets of hydrology”, which was by the way the title of a book authored by John Rodda. I think that one of the major recommendations of IAHS has also been putting all the hydrological data and aspects together in a synergic way. The symbolic representation of an elephant, as proposed by Siva, for the very successful PUB initiative, is an excellent illustration of the concept of integration. Panta Rhei is an excellent and befitting idea that can contribute in the current decade, for integration, not only within hydrological sciences, but also between Earth Sciences and Social Sciences. Hydrologists should nevertheless be cautious as it looks that Hydrology could be “dissolved” in Water. One can see that, on the international agenda, the more it is spoken about Water, the less it is spoken about Hydrology and that less means are devoted to it, especially to gather the essential hydrological data. As a typical example, IAHS has been at the beginning supportive, including financially, of the World Water Forum and organized a few sessions during its first editions, but the share of hydrological aspects vanished rapidly. While participating as the IAHS representative in a preparatory meeting of the Marseilles World Water Forum, I realized that there was absolutely no place for any Hydrologist to discuss and share his experiences and concerns! A close observation of the program of the World Water Forum that was held in Korea a few months ago also shows that hydrology was not present. In this context, I wish a long and sustained life for Panta Rhei and I will be happy to contribute in any small way I can for its growth and sustenance. Hydrologists should learn from others, and should understand their concepts and concerns, but they also should convince the concerned, and the experience shows that it will not be easy, that hydrology is very important for an effective and proper water management and to provide useful contributions to address the societal needs.